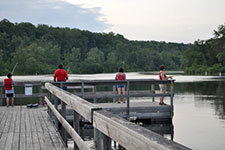 Fishing piers and shorefishing sites are available throughout the state. Parking is generally located within 300 feet, with a hard surface path from the parking area. Most are designed to meet the needs of people with disabilities. The DNR cooperates with local units of government to install and maintain the piers.